The Saddle Barn offers guided trail rides, pony rides and hayrides. Open 9 am to 5 pm daily (weather permitting) during high season (weekends only in the shoulder season). Closed in winter. The Saddle Barn can be reached by phone at (812) 988-8166. Call for prices and details. You are welcome to bring your own horse to explore the some 70 miles of bridle trails through the steep, forested hills of Brown County State Park. Day-use parking spots, as well as Class C (primitive) campsites and Class A campsites are available at the Horsemen's Campground, which caters to horse riding enthusiasts. Each horse you bring into the park must have a Horse Tag (see below). Horse Tag ($5 Daily/$20 Annual) entitles one horse access and the use of DNR properties where horse use is allowed. A Horse Tag is required for each horse on DNR property. The Annual Horse Tag is good from January 1, until December 31, of the year issued. Interested in other places to go horseback riding in Indiana? 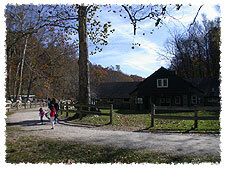 Check out this great info on Hoosier National Forest and Indiana State Parks from IndianaOutfitters.com.